Join us for our Discover Scuba Diving program and learn the basic safety guidelines and skills needed to dive under the direct supervision of a PADI Professional. 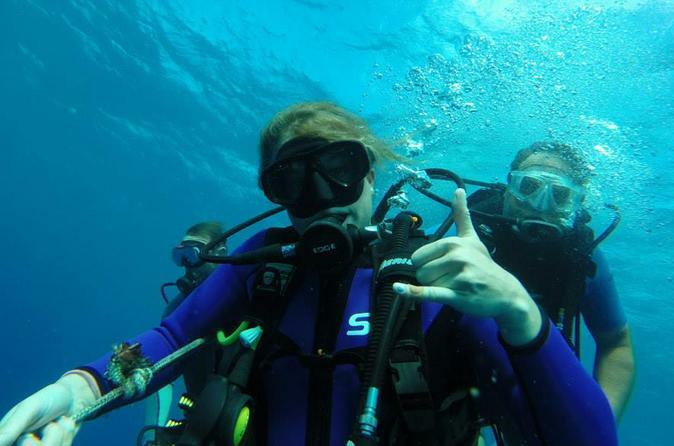 Have fun swimming around and exploring while putting those key skills to use with an instructor on a shallow reef dive. While not a scuba certification course, Discover Scuba Diving is a quick and easy introduction to what it takes to explore the underwater world. Everything is Included!! no extra fees for gear rentals, or the boat, or anything else! We start at the dock with a safety orientation where will teach you about scuba and what you need to be aware of to stay safe as well as how to have the most enjoyable time possible. We load up the boat and depart when we are ready to go. We never rush you to maintain a schedule, let's just have fun. You will learn a couple quick skills in the water to help keep you safe, then we're off! We'll explore the site together, your instructor will point out cool animals, all the while keeping an eye on you and the group. After the first dive, we set up new tanks and do it all again. That's right, TWO dives. The second dive is often much better as you are now far more comfortable in the water. After two great dives, we will return back to the slip just in time for an evening activity.